Kanno, S., Kurita, Y., Ohnishi, M. and Mimura, T. (2014). Autoradiography of Pi Distribution in Barley Seedlings. Bio-protocol 4(13): e1175. DOI: 10.21769/BioProtoc.1175. Phosphorus-32 and Phosphorus-33 are radioisotopes of phosphorus. These isotopes are used to trace ionic phosphorus and phosphorus compounds. This protocol is used to follow the movement of inorganic phosphate (PO43-) from a leaf tip to the rest of the plant. Barley plants are germinated on moist filter paper for 2-3 days and then seedlings are grown in hydroponic culture for 7-8 days. 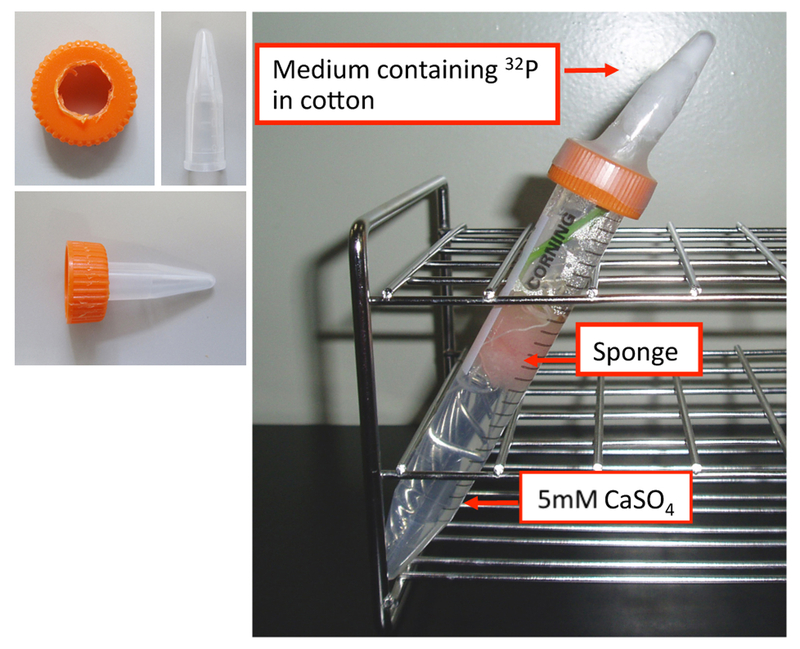 Cotton is put in a 1.5 ml tube from which the cap has been removed, then a radioisotope medium consisting of 600 µl of 0.2 mM NaH232PO4 (specific activity 3.7 MBq nmol−1) in 5 mM CaSO4 is added. Cotton is put enough to absorb all 600 µl NaH232PO4, But, do not put too much cotton to keep it moisture. Into the 15 ml tube, an appropriate amount of incubation medium (5 mM CaSO4) is added. A barley plant sandwiched with sponge is put into the medium, and the barley leaf is manipulated into position against the plastic sponge separated from solution, such that when the smaller tube containing the cotton is mounted into a hole in the cap of the 15 ml tube, the tip of the leaf comes into contact with the cotton soaked in radioactive medium (Figure 1). After an appropriate labelling period (about 2 h) at 25 degrees, the sample is washed with water several times and wrapped with cling film. The sample is then set on an imaging plate and exposed (Figure 2). To avoid contamination of imaging plate with 32P, samples are wrapped by cling film. Wrapped sample is attached to the imaging plate by using binding case to expose. Examine the imaging plate with an imaging analyzer (Figure 3). 32P concentration is indicated by pseudo-color. Following imaging, plants can continue to be incubated in 5 mM CaSO4 solutions under the same light conditions for 1 or 2 d without cap in order to examine the movement of the radioisotope. 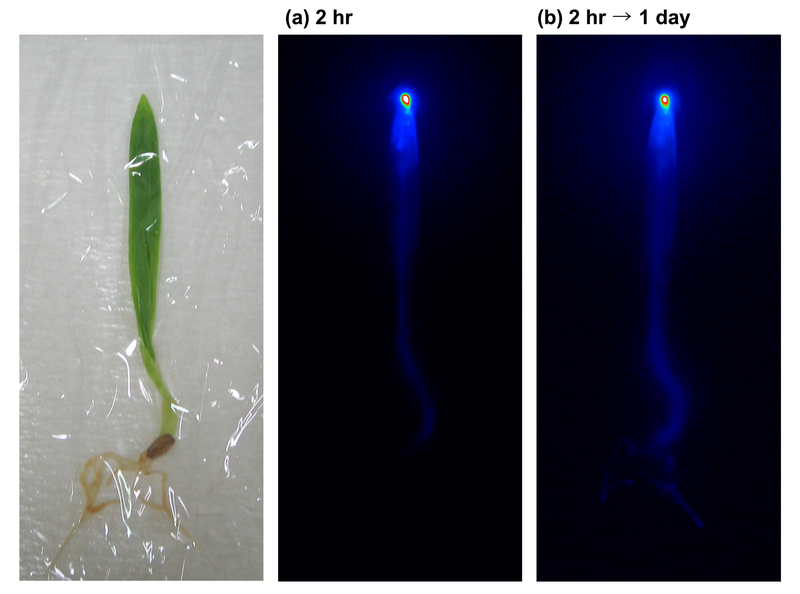 In Figure 3 it can be seen that NaH232PO4 absorbed at the leaf tip was translocated to the root after one day of incubation. Figure 4. Autoradiogram of 32P distribution in 10 days old barley plant grown in a Pi-deficient medium, which was radiolabeled from the root. The number put at the leaves in order of development. Resolution and clarity of images are strongly dependent on the radioisotope contents of plants and exposure time on the imaging plate. This protocol was adapted from the following publications, Nagai et al. (2013) and Mimura et al. (1996). This work was supported in part by Grants-in-Aid for Scientific Research from the Ministry of Education, Culture, Sports, Science and Technology and Japan Society for the Promotion of Science (JSPS), CREST of JST (Japan Science and Technology Corporation) and in part by Hyogo Science and Technology Association. The authors also thank Yokogawa Analytical Systems Inc. for use of ion chromatography equipment. Mimura, T., Sakano, K. and Shimmen, T. (1996). Studies on the distribution, re‐translocation and homeostasis of inorganic phosphate in barley leaves. Plant Cell Environ 19(3): 311-320. Nagai, M., Ohnishi, M., Uehara, T., Yamagami, M., Miura, E., Kamakura, M., Kitamura, A., Sakaguchi, S., Sakamoto, W., Shimmen, T., Fukaki, H., Reid, R. J., Furukawa, A. and Mimura, T. (2013). Ion gradients in xylem exudate and guttation fluid related to tissue ion levels along primary leaves of barley. Plant Cell Environ 36(10): 1826-1837. How to cite: Kanno, S., Kurita, Y., Ohnishi, M. and Mimura, T. (2014). Autoradiography of Pi Distribution in Barley Seedlings. Bio-protocol 4(13): e1175. DOI: 10.21769/BioProtoc.1175.